There is an abundance of BLM land around Moab, so finding a place to park Backpack for this trip was relatively easy. The hard part was picking an area! The spot we ended up in is gorgeous and is just right for our type of camping. Here is where we ended up boondocking in Moab Utah. The campsite we chose is about 10 miles northwest of Moab on Willow Springs Road. This road is a popular boondocking site for RVers and campers of all types. Our site is approximately a half mile down the dirt road, but there are campsites all along the road. There are several other large motorhomes camping along this road, as well as travel trailers, fifth wheels, and even tents. Although there are many other campers along the road, it is dispersed enough that we do not feel crowded. We can comfortably let the dogs run around off-leash, and there have been no issues with too much noise from our neighbors. Of course, there are ATVs and dirt bikes going up and down the road all day, so if you are looking for quiet, this is not the place for you. But for us, we enjoy seeing all of the fun activities everyone is doing around us! Willow Springs Road is a packed dirt road that is bumpy, but still passable. We have driven up and down the road several times in Daypack (our Fiat), which has very low clearance, and we have had no issues. Getting Backpack (our RV) into the campsite was no problem either. As you go further down the road, it does get a bit bumpier, and it seems the campsites become more and more geared toward tents after a mile or so. That is as far as we were able to take Daypack, so we can’t speak to what is beyond that. Well, we certainly aren’t the type to settle for a lousy campsite, and this one did not disappoint! The site offers gorgeous panoramic views all around. It is a beautiful spot to stay. It is about 10 miles from the town of Moab, so it’s in a good, central location for many activities. There are fire rings as well at each campsite; however, firewood is scarce in this area. We have not been able to build a fire due to the lack of firewood around. If you are set on having a campfire, you can always bring it in from elsewhere. Beautiful! We used to live in Fruita, CO and would often visit this area. It’s so close! We drove through Fruita last week on our way to Moab! That’s a pretty area, too! Shhh…. don’t tell too many people about our favorite boondocking site near Moab. This is our go to spot for our Moab visits. We’ve been there a couple of times when the wildflowers were blooming. Ooooh, I’d love to see the wildflowers in bloom! It is a gorgeous spot! Hey! I’ll be here in a couple of weeks! Is it ok to show up early and leave my tent set up while I go out to the park all day? Or would it be better to show up in the evening? I don’t want to show up late and not get a spot however…. Any advice would be appreciated. There is nothing wrong with leaving your camp set up all day. By rule, you can leave your camp set up for 14 days at a time! Just practice good etiquette and pitch your tent in a spot that is too small for an RV to fit. Have fun! That is to the exact site we camped at, but there are many more in the area! I can see that it must be very difficult for you two living in the backcountry! I hope that Fiat held up under the stress ! Hi. Great site! Thank you! We are experienced 5th wheel RVers from the northeast planning a summer 2019 return to Moab and Bryce with our friends (also RVers) who have never been west before. Because of time constraints we can’t bring our rig this time. Considering flying out and renting a large Class C for the 4 of us (I know, rental, ugh…). We’d have a genny, 40 gal of washing/flushing water, and no toad. 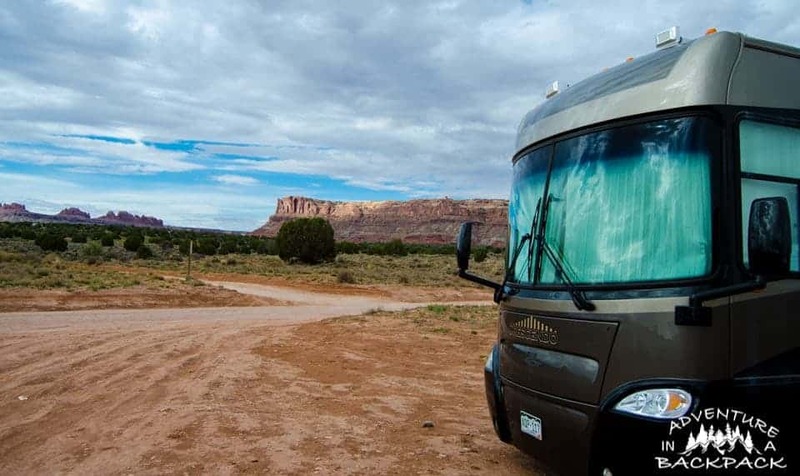 What are odds of finding nightly boondocking spots outside of Moab and/or Bryce in the summer? Can we leave a small tent, etc to hold our spot while we’re driving the RV around during the day? We’re planning to hit a commercial campground every third night or so for dumping. Other days, where can we top off the water tank? It will be strange not to have our own rig. Any suggestions? What else haven’t we considered? Hey! That’ll be an awesome trip! 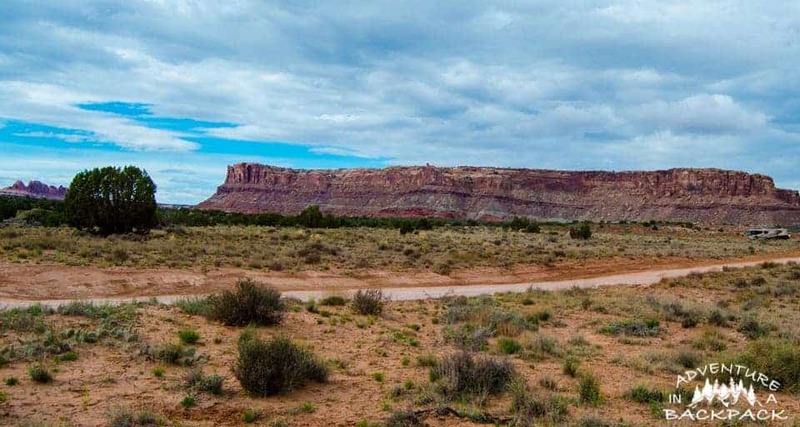 Moab and Bryce both have a ton of BLM and National Forest land around them, so you should have no problem finding a boondocking site at either place. You can definitely leave a tent in your spot to claim it while you go adventure for the day. Lots of people do that. As for water, there are typically water hoses/fill ups at the visitor’s center or the BLM office. Even if you can’t fill the full tank, I’d recommend getting a drinking water jug (5-7 gallons) to make sure you have some water. Many of the campgrounds will also let you dump tanks and fill water for a small fee, usually $5-10. If you aren’t wanting to camp in the campground, that is a viable option as well. I hope you have a ton of fun!